This should go without saying, but there are spoilers from both tonight’s premiere of Gracepoint, as well as the British series Broadchurch in the following paragraphs. Proceed with caution. 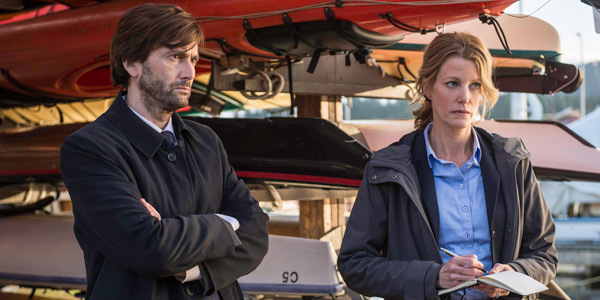 Even before tonight’s premiere, Gracepoint was already getting a lot of comparisons to Broadchurch, the BBC series that Fox’s new drama is based on. 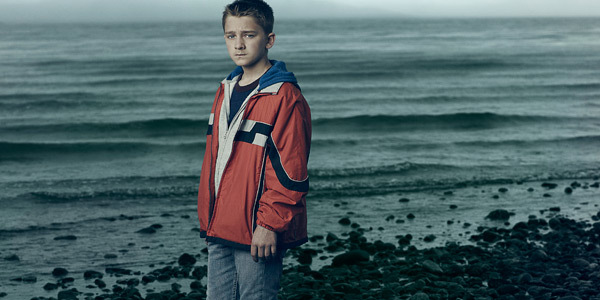 In its season opener, Gracepoint does have a lot of similarities to Broadchurch, from the way certain characters react to various events to the way shots are set up by writer Chris Chibnall during the premiere episode, which opens with a shot of a young boy standing on the edge of a cliff, then bleeds into a shot of the headboard of a young mother who wakes suddenly, feeling something is not right with the world. There are similarities in the feel of the town and certain bits of dialogue that pop out of the mouths of characters. There are similarities in the grief of a family who has lost their young son, grandson and brother, and feelings of unrest in a community that otherwise has been known for safety. 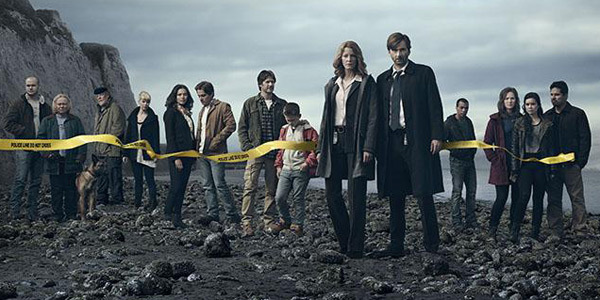 However, Gracepoint, due to network restrictions, an American personality and some fantastic work by the show’s cast members, is not Broadchurch, even if it echoes the British series from time to time. 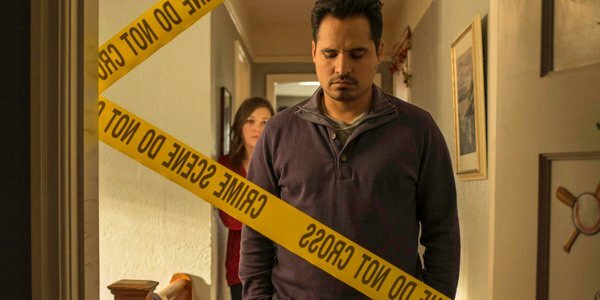 Following are the biggest changes I noticed while viewing Gracepoint. If there are other notable moments you feel I may have missed in my viewing of the Gracepoint pilot, feel free to point them out in the comments, below. Gracepoint’s cast is extremely diverse. The owner of the inn is British. The racial makeup of many of the characters is different from their British counterpart. There are a lot of nationalities and cultural viewpoints brought in to Gracepoint that wouldn’t have worked as well in Broadchurch, but are less of a surprise on Fox, as the network is known for having diverse casts. 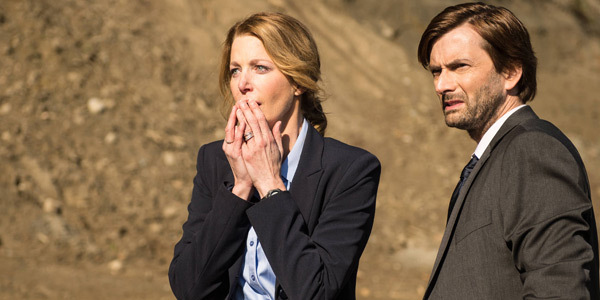 Just as Broadchurch easily fits into British life, Gracepoint fits into American life. Broadchurch brings up CCTV cameras and 99’s, otherwise known as Brit ice cream with a flake in it, while Gracepoint decidedly fits into small town American life. Changes are made to work for America, including the name of the case Tennant’s character worked on before taking this job. 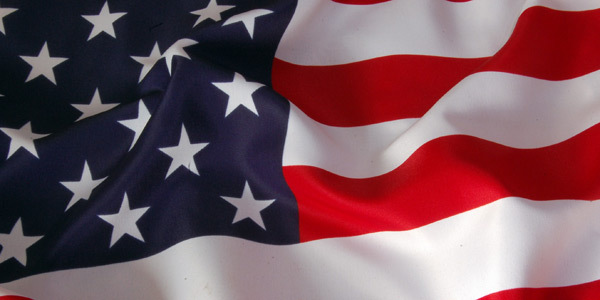 Britain’s Sambrook becomes the US’s Rosewater and so on and so forth. 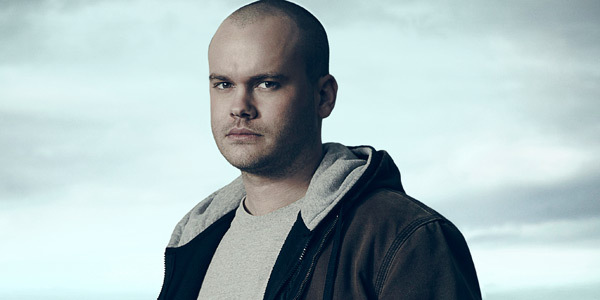 Things don’t seem so great between Mark and his apprentice, Vince, before Danny is even found to be dead in Gracepoint. Vince is already asking for a raise and the two men aren’t particularly jocular in each others’ presence. Since Gracepoint is set to have a different trajectory than Broadchurch, this should have an effect later on. 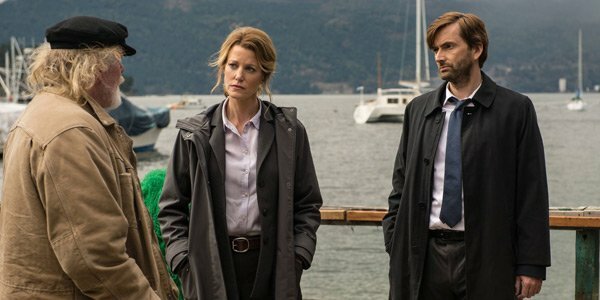 In Gracepoint, the fact that Ellie loses her job to a male detective is a bigger deal. Ellie is angry with the Chief because he stated he wanted, “More women in positions of authority in this department.” In Broadchurch, the head of the police station is a woman, so the point is rather moot. It’s a subtle change, but one that makes Emmett Carver’s hiring even more annoying for Ellie. Gracepoint’s resident reporter, Owen, seems a lot more comfortable with his role in the small town. He makes snarky comments about the town’s field day and is a little more dogged about pestering Ellie. He doesn’t seem to be wishfully hoping he can escape small town life and make it at The Daily Mail. He’s a lot more likeable, honestly. Danny doesn’t have a paper route. 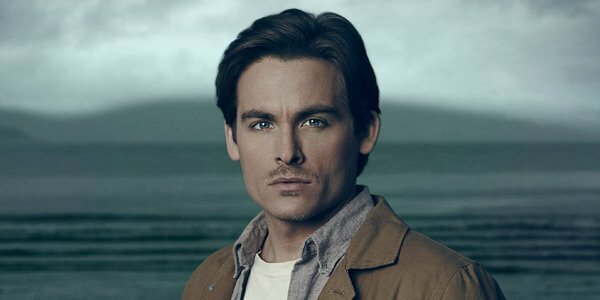 Instead, he works more intensely with Jack Reinhold in the mornings, taking down information about the local sea life. He and the other boys take turns going out to look at local sea life, which Jack says helps them to get closer to nature. Who has a paper route anymore, anyway? Danny is killed by blunt force trauma to the head, rather than getting strangled. In both situations, he would have looked his attacker in the eyes. This might begin to explain how Gracepoint will end up at a different point than Broadchurch. 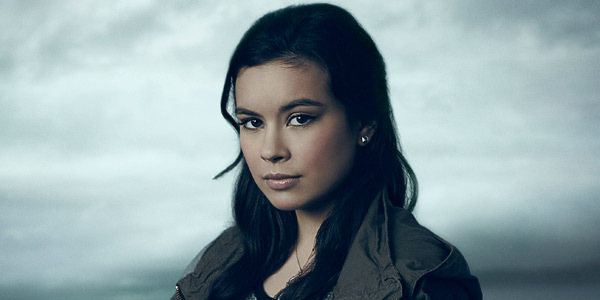 In Gracepoint, Ellie and her son Tom have more of a heart to heart over Danny’s death. Ellie tells him, “You can be sad, you can be really angry, you can be confused; it’s OK to cry.” It’s a little different and more emotive than the conversation Broadchurch Ellie has with her son. We know Chloe is sneaking around, but there’s less of a point made about her being young and meeting a much older boy. I'm guessing the secret boyfriend will still be an important part of the series, but perhaps it won't.